I've been adding to my obsession of sheer lipsticks. I may have mentioned before, but sheer lipsticks are now my favourite category of lip products. Now, I haven't bought a Giorgio Armani lip product in a while. The last one I got was a gorgeous red named Scarlatto (they also have a Sheer with the same namesake, but it's not the same). I believe it was limited edition as it released with a Fall collection. I didn't check my counter if it was still available, but if it's not, I wish they would bring it back. It's seriously the perfect red for me. 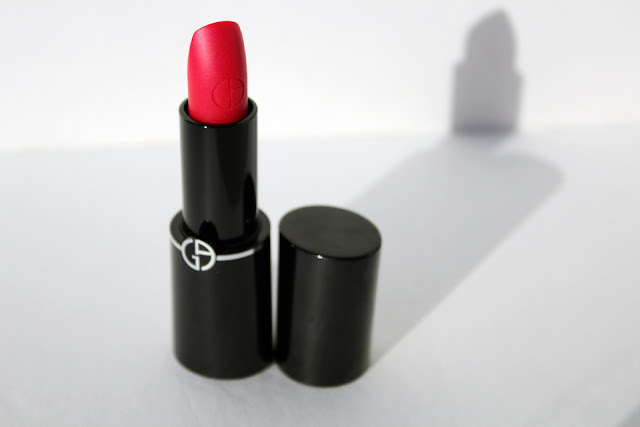 That's not really what this post is about, so, enter the Rouge D'Armani Sheer Hydrating Color in #500. Armani added this new formula to their lineup, and I'm in love. If Holt Renfrew hadn't promoted this shade as part of their Hot at 75 celebration, I don't know how long it would've taken me to discover it. 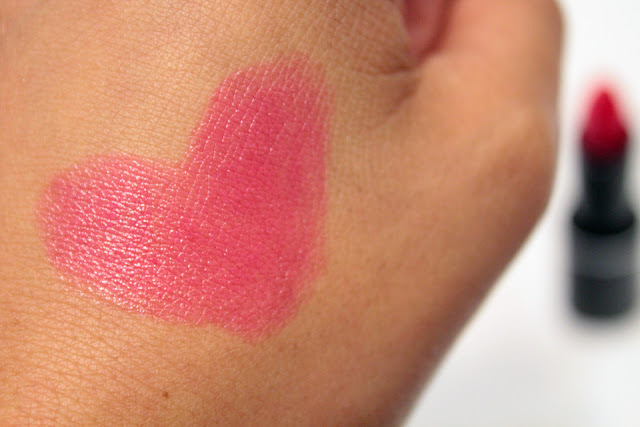 It's a gorgoeus bright magenta / fuschia shade that's stunning on. The formula goes on smooth and comfortably, almost like a balm but heavier. It has a semi-gloss finish and leaves a pretty stained look to your lips. The downside to any sheer lipstick is the longevity, or lack thereof. Three hours, tops, but the pigmentation leaves some colour on your lips even after the glossiness has faded. 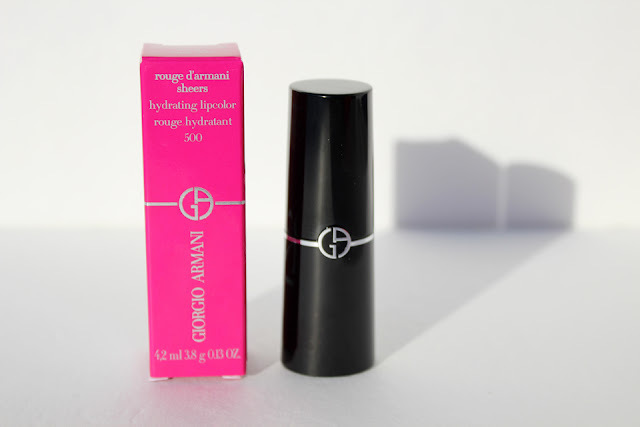 The packaging is simple: sleek black tube and magnetic cap (which is pretty strong and stays in place in my makeup bag). I also quite like the simplicity of the colour range. There's three shades in each colour family (i.e., oranges, reds, pinks, and purples). No nudes, though. That's another downside. This has got to be my favourite sheer / hydrating lipstick. I feel like I have a new favourite every time I pick one up, but I have been really enjoying this one. It feels great to apply and I adore the colour. I wanted to add a selfie wearing this shade, but alas, I was not having a good camera day, so hopefully the swatch does it justice. That's a really nice color! Would love to see how it goes on your lips, I've never tried their lipsticks, but if it's hydrating, I'm already interested! 3 hours isn't that bad for a sheer lipstick, the colour is beautiful! I'm just barely entering the world of coloured lippies, topping out at very pigmented tinted lip balms. I think the Rouge D'Armani Sheers may be exactly what I'm looking for in a "lipstick"!